Tomorrow marks the conclusion for me of 90 days through the Bible. I utilized youversion.com to help me track progress. I have read my way through all 66 books on my smart phone and Mac, not one page from my printed Bible. I have to say that it has been an intense three months of reading but I am so glad that I committed to this process. I did so with many people from Cross Community Church who enjoyed an “Exponential Summer” (E90). Now that I have just a few chapters in the Book of the Revelation left, there is a small part of me that will miss the large amount of reading every day. I think I averaged around 16 chapters a day. I do have another reading plan in mind to start on September 1, but it will not be this great of a challenge. I am full to the brim with the Bible. I find it interesting that staying focused on God is much easier these days. There isn’t a lot of interest in other things, some hobbies have taken a back seat. I do not regret the TV I have missed, the baseball I didn’t watch or the Internet surfing I eliminated. I am at peace. Even some stressful situations that I faced this Summer didn’t rock me as they normally would have. I am stronger. I even received some comments about how much more laid back I appear to be! I got a TON of great message ideas. I feel like I could preach for a year on the passages that I have been reading just the last few weeks. I guess it helps when pastors actually read the Bible, huh? I did hear a little criticism this Summer from people who didn’t like my approach: “Too regimented”, “There’s no way you can absorb all that material!”, “I emphasize quality over quantity”, etc. Here’s the deal: I read every word for myself, and God really spoke to me. Don’t criticize unless you can show me how to improve. 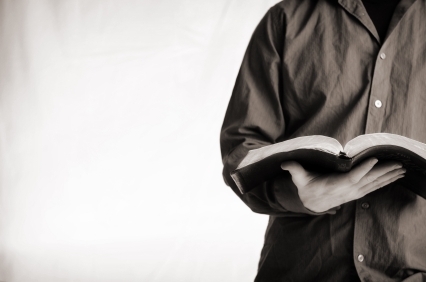 Let me encourage you – spend some time with God and His Word. Be intentional and committed. God has something to say to you that will change your life. We are intentional with our spiritual formation process at Cross Community Church. The conclusion of E90, an “Exponential Summer” has escorted us into the next season of growth. 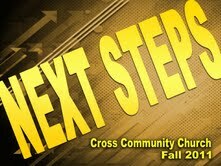 Take a look at Next Steps. Regardless of your location, you can participate with us as we pursue God. We are committing to Grow, Connect and Serve. As we process, we will impact others. The result will be more lives changing as we connect people with Jesus Christ. This Sunday at Cross Community is big. Don’t miss it! This week, I was privileged to attend the Willow Creek Association Global Leadership Summit. The event is held every year in Chicago, but I attend a video venue here in Palm Beach Gardens. I highly respect Willow Creek Church Pastor and WCA Founder, Bill Hybels. He has been a stellar leader for many years and his stock continues to rise in my book. The variety and quality of leaders at this event is unparallelled. Each year they gather well-know and lesser-know men and women from around the globe who are leading businesses and NGOs and ministries to present fresh leadership concepts to over 180,000 Summit participants. This year, some of my favorite presenters were: Dr. Brenda Salter McNeil, Seth Godin, Mama Maggie Gobran (blog post coming on this woman!) and Michelle Rhee. For a very thorough look into the training and the specific talks given by these amazing leaders, access the official blog. There is a month’s worth of great reading on the site. One of the beauties of the Summit is that it serves as a place of exposure and access to such a variety of gifted leaders and communicators from an amazingly wide variety of fields. 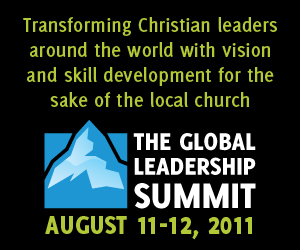 I highly recommend the WCA Global Leadership Summit to anyone who is leading or plans to lead. The date next year is August 9/10. I am a better leader today and will be into the future because I was involved in the 2011 Summit. The concepts taught in this simple video are some things we are working on at Cross Community Church. We believe that there is more to church than what we see in many cases. 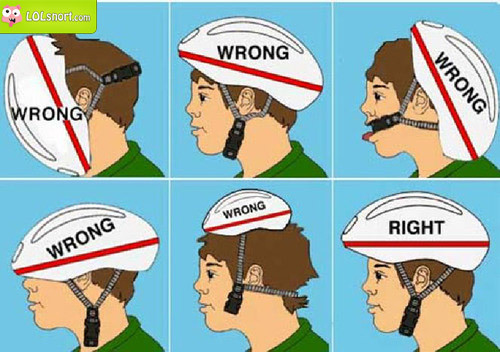 Take a look and feel free to process it with us. how scared are you about our financial future? It’ not a good day in America. 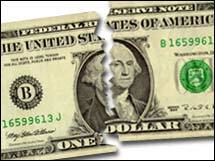 Today, rating agency Standard & Poor’s says it has downgraded the U.S. credit rating to AA+ from its top rank of AAA. This will more than likely start an even further negative downward financial spiral in our country. We’re in for tough times. Here is what I want to ask Christ followers right now: are you ready to offer some hope to the people around you who will be reeling from all of this? My fear is that we will be just as freaked out as everyone else and we will miss this major opportunity to display our faith in a time of crisis. Bad times always create ministry opportunities. People are hurting and the pain will increase. We simply must be in the position to make a positive difference. 1. Be sure that you trust God. If you don’t believe that He will take care of you, you have nothing to offer to anyone else. 2. Stop looking to people to provide for your future. No politician can offer the security you are looking for. Only God can do that. 3. Be sure that you are not too much in love with luxuries and a comfortable lifestyle. 4. Commit to God that, no matter what happens, you will live for Him. This is no time for fair-weather Christians. 5. Be faithful in your stewardship. Tough economic times are not the time to cut back on your giving to God. 6. Have a long-term perspective. I’m not giving investment advice. I am saying that this world is not our home. We won’t be here much longer. Heaven is where we belong. 7. Look at the believers around the world. For centuries, Christ followers all over the world have displayed grace and dignity when deprived of wealth. Allow their testimonies to encourage you. Get ready for difficult days. Don’t lose your composure and blow your testimony. Let’s not miss this excellent opportunity to show those around us how Christ-followers face, with great faith, difficult times. I am thinking that, from a spiritual perspective, this crisis may be the best thing for America. Maybe we will return to God.